NEW DELHI: The recently-concluded Amazon Web Services Excellence Awards 2016 showcased a plethora of insights to one of the most dynamic digital phenomena cloud-based digital services. 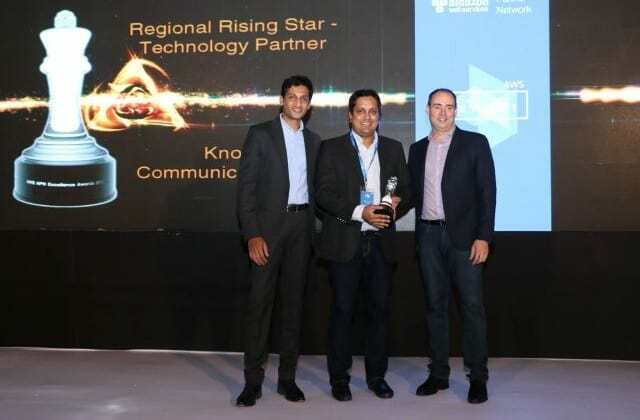 Knowlarity Communications, one of the largest cloud communications platforms in emerging markets, won the coveted Regional Rising Star Award-North India. The company was felicitated for its continued excellence in the field of cloud-based interactive products and solutions. Knowlarity is trusted by over 15,000 businesses across 65+ countries as the leading cloud communications provider in emerging markets. It provides a suite of hosted products that make business telephony reliable and intelligent. Its flagship product ‘SuperReceptionist’ processes over 2 million calls a day. Backed by Sequoia Capital and Mayfield, two of the most prestigious Venture Capital firms worldwide, Knowlarity is headquartered in Singapore and has offices located in India, Turkey, Dubai and the Philippines. Organized at JW Marriott, New Delhi on 29th June,2016, the AWS summit saw cloud computing based industry leaders come together to share their knowledge and vision about the growing cloud practice in relationship with AWS. It provided prospective and existing cloud-computing driven service providers with immense scope for networking and learning about APN and the value of being an APN partner. The AWS Partner Network (APN) is the global partner program for AWS. It is focused on helping partners build a successful AWS-based business by providing great business, technical, marketing, and GTM support. AWS summits are counted as one of the most important technological events across the globe. These summits are platforms for cloud-based service entrepreneurs to interact with AWS technical teams and get their queries answered. The AWS event in Delhi was the second of three AWS summits in India. The other summits were held at Mumbai and Bangalore. Knowlarity bags Regional Rising Star Award at APN EXCELLENCE Awards 2016 0 out of 5 based on 0 ratings. 0 user reviews.